Comments/Origin: The Tree of Poetry is a very uncommon species of plant; it is an American maple, which is in Venezia-Mestre in 83/B Cavallotti Street, Itinerari '80 Centre. Giancarlo Da Lio, inventor of Itinerari '80 too, dedicated this tree to Poetry in a lot of artisitic Performance. The tree strikes its roots into the soil, but branches toward the light of the Sun: to be and to become. 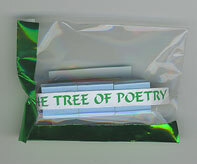 Below its fronds sheets with verses in plastic envelopes, to preserve from rain, hang down. The poets read their lines in the shade of the tree. And painters and sculptors put their works on walls and grass. Itinerary '80 is an artistic movement; from different trends many excellent artists gather strength around Giancarlo Da Lio. Moreover, as well as they work, they must manage their work making use of everything and everywhere. Well, it is necessary to show works not only in the official galleries, but above all in the alternative art spaces: where people go ans come, on the road, in the shops, in the gardens too: so the tree of Poetry was born and is growing.